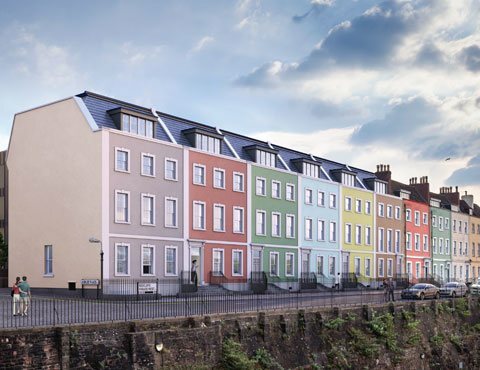 The first phase of the eagerly anticipated new development of luxury apartments at Redcliffe Parade, one of Bristol’s’ most sought after waterfront locations, has been released. Buyers are now able to reserve one of these beautiful and exclusive one or two bedroom apartments off plan and many of them also benefit from secure allocated parking. With rare and spectacular views towards the Floating Harbour and City, Redcliffe Parade occupies a tranquil and elevated position only minutes from the heart of Bristol, offering an ideal waterfront location to enjoy all that Bristol has to offer. Redcliffe Parade is one Bristol’s most notable architectural landmarks and highly respected developers Change Living are undertaking the careful and expert restoration of this historic Georgian terrace, which will see many original features being retained. These features will be complemented with the very best in contemporary design, with handmade Neptune kitchens, including integrated Neff appliances, giving style and a sense of individuality to each apartment. The Porcelanosa bathrooms will provide luxury and modern functionality. Knight Frank and Ocean Estate Agents have been jointly instructed to market this spectacular development and will be able to guide purchasers through the process of reserving their new home at this beautiful conversion.